Dr. Ajay Rastogi, MBBS, MD,(Medicine) CCEBDM, (Diabetes) is welcomed to medicoSA—Global Healthcare Ecosystem on Cloud. Dr Ajay Rastogi is a senior consultant physician & Diabetologist practicing in the noida & indirapuram area for the past 15 yrs. He is managing acute & chronic medical diseases including diabetes, hypertension, thyroid disorders, chest diseases , infectious diseases etc. He has worked at various positions in renowned hospitals of delhi/ NCR like GTB hospital Delhi, Apollo hospitals delhi & noida, shanti gopal hosp. indirapuram & Fortis hospital noida. Presently he is available at his clinic at jaipuria sunrise plaza indirapuam & visiting cosultant at shanti gopal hosp. & fotis hosp.noida. 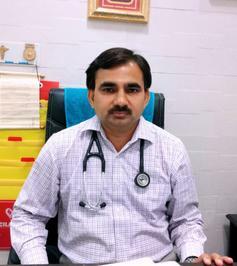 He is a life member of Indian medical association & association of physicians of India.